Six UK soldiers have been killed in southern Afghanistan when their vehicle was hit by an explosion on Tuesday. Five from the 3rd Battalion the Yorkshire Regiment and one from the 1st Battalion The Duke of Lancaster's Regiment had been on patrol. Their families have been told. 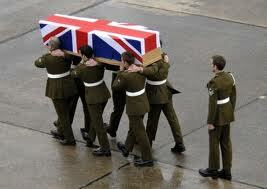 It is the biggest single loss of UK life at one time in Afghanistan since a Nimrod crash killed 14 in 2006. The number of British military deaths in Afghanistan since 2001 is now 404.